Presidential hopeful Jeb Bush has been careful not to criticize his father and brother, the previous two Republican presidents. Yet Bush offered this week a mild critique of his brother’s fiscal policy as comparisons to his family will likely increase. During a Thursday appearance at a sports bar in the early primary state of New Hampshire, Bush was asked how close his positions track with those of his older brother, former President George W. Bush. Jeb Bush, who is considered a potential frontrunner for the 2016 Republican presidential nomination, but has not officially entered the race, said that his brother’s record on government spending is one area where the two differ. While Jeb Bush has carefully distanced himself from is brother's decision to invade Iraq in 2003, his comments in New Hampshire marked the most public denunciation he has offered of his family's track record. His father, George H.W. Bush, was president from 1989 to 1993. As for Jeb Bush's own record on government spending as governor of Florida from 1999 to 2007, the right-libertarian Cato Institute has said Bush was "a prolific tax cutter, but he let spending rise quickly toward the end of his tenure." Bush said in a separate New Hampshire appearance on Wednesday that he loves his father and brother, and that “people just are going to have to get over that," the Post reported. Bush has strived to make his campaign-like appearances center on his attributes and record as Florida governor. 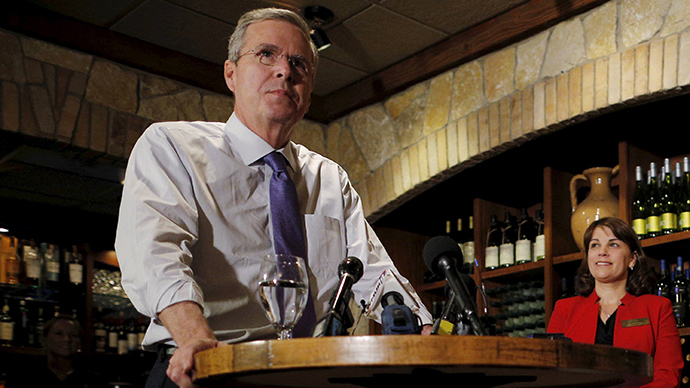 In New Hampshire, Bush may have more trouble than his father and brother. Reliable, monied supporters, who strongly backed the George H.W. and George W. Bush campaigns, are not offering the same support for Jeb, according to the Boston Globe. Bush is also receiving scrutiny for how he is raising money on the way to his near-inevitable run for the presidency. By not officially entering the race, Bush's Super PAC (political action committee) -- Right to Rise -- can raise money in ways declared candidates cannot, according to the Inquisitr. Bush is a top choice for the Republican presidential nomination among establishment Republicans, but his popularity is not as high among the most conservative wing of the party. A recent Pew survey showed how more moderate Republicans have placed Bush above other top candidates, while conservatives have a generally unfavorable view of the Bush family standard bearer compared to others in the field.